ORANGE COUNTY MODULE RAILROADERS, INC.
1. Interchange - The ability to physically and electrically connect the module to any other club or member owned modules to establish a modular layout. 2. Reliable operation - The ability of all members to operate, without derailments or electrical problems, their HO scale locomotives and rolling stock from diverse manufacturers that adheres to some minimum set of standards. 3. Esthetics - Conformance to a minimum set of appearance specifications such that a complete club layout will have a pleasing appearance to the viewing public. 4. Safety - The assurance that all club or member owned modules will conform to the fire and electrical safety regulations that are reasonably expected to be imposed by local codes, ordinances, or exhibit venue regulations. Although it is expected that each member will be responsible for setting up his or her module and connecting it to the adjoining modules, the goal is that any member who is familiar with this standard will be able to physically and electrically connect any module to any other module or to determine by inspection that the modules are properly connected. In addition, a module that technically conforms to the letter of these regulations but does not operate reliably will be deemed to be non-compliant. Within the rules established by these standards, members are free to establish track arrangements and scenery themes as they wish. Cooperation with other members is encouraged and the club will take this into account when establishing the module arrangement at shows. However, space restrictions and module availability at specific shows make it impossible to guarantee that modules will always be arranged in a specific configuration. Members are encouraged to consult with the Standards Committee to determine whether a specific module configuration is reasonable in the light of past experience. Variations on any of these standards must be approved by the Standards Committee prior to construction. If you have any questions about these standards, please consult with the Standards Committee before proceeding. I. 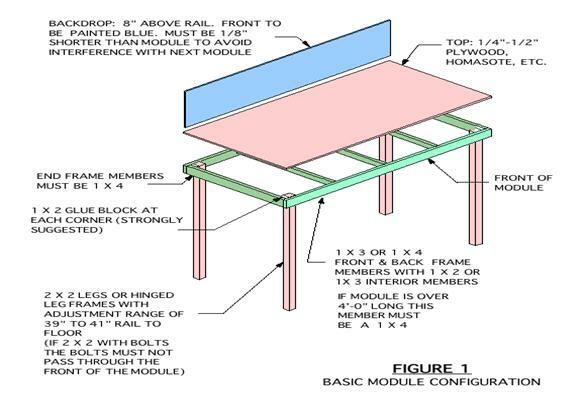 Construction – The components of a basic module are illustrated in Figure 1. A. The module frame must be solid wood (no plywood or particle board except baltic birch or equivalent). 1. Use 1x4 or1x3 dimension lumber (pine, fir, poplar) for main structure framing. The end plate must be1x4 as shown in Figure 1. 2. Joints must be glued and screwed (#7x2" wood screws or 2" deck screws are recommended). 3. Longitudinal and lateral cross members must be used as needed for stability, track support, and to insure that light weight materials used for the module surface will not sag with age. 4. The module frame must be true and square horizontally and vertically. A framing square and the measurements shown in Figure 2 will be used to verify that the frame is square. 5. Module ends must be square with the track center lines vertically and horizontally. 1. Length must be an even multiple of two feet (2', 4', 6', etc.). 2. The most popular module width is 24 inches. The maximum and minimum are 36" and 12" respectively. The nominal height of the railhead is 40" from the floor. Height must be adjustable +/-1" from the nominal 40" after the module is set up. The legs must not interfere with the installation of the front plastic panels. 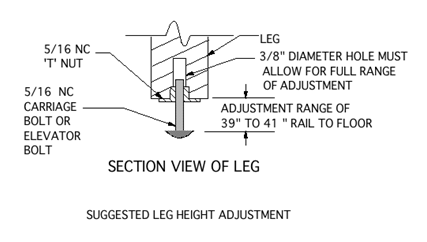 One method of providing the required height adjustment is shown in Figure 3. D. Attachment - Modules are fastened together using 5/16 NC x 1 1/2" Hex. head bolts, fender washers (1 1/2"), and tee nuts. 1. Bolt holes are to be located by a club-supplied fixture and drilled by a Standards Committee member. See Figure 5 for approximate locations. The area in which the holes will be drilled must provide clearance for a 5/16 NC tee nut and fender washer. 2. The tee nut is installed in the left hand end of the module as viewed from the front. E. Finish - The module framework and back of backdrop must be painted flat black. 1. It must be secured firmly to the framework. 2. In the area of the mainline roadbed, the surface must be flat and level. 3. It must be sufficiently rigid to support HO scale trains powered by several weighted locomotives without deflection. 1. Tunnel portals and retaining walls must allow adequate access to the roadbed for installation of the interface tracks. 2. The interior of tunnels must be accessible from the rear or underside of the module. The Standards Committee will determine whether or not access is acceptable. 1. Backdrops are required on all modules except corners. 2. Backdrops will be 8" above the mainline railhead. 3. Backdrops must be painted a sky-blue color that will be specified and provided by the club. 4. When the basic module scenery is continued onto the backdrop (e.g. mountains, forests, etc.) the height and color requirements may be waived by the Standards Committee. 1. All modules will have a clear plastic panel attached to the front of the module as shown in Figure 4 at all shows. 2. The club will provide the plastic, fascia board, spacers, and Velcro strip. 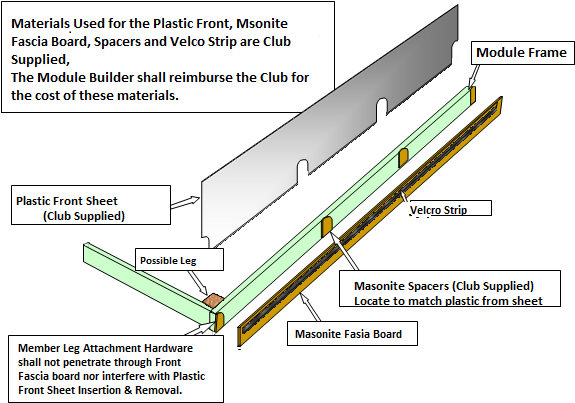 Materials Used For the Plastic Front, Masonite Fascia Board, Spacers and Velco Strip are Club Supplied. The Module Builder shall reimburse the Club for the cost of these materials. Member Leg Attachment Hardware shall not penetrate through Front Fascia board, nor interfere with Plastic Front Sheet insertion and removal. 3. The club supplied Velcro strip, shown in Figure 4, will be used for attaching club supplied curtains. It must be attached to the front of the fascia board 3/4" below the top. If the Velcro strip is not self-adhesive, it must be attached with contact cement. 4. The member will reimburse the club for the cost of the materials. 5. Each member is responsible for transporting and maintaining in good condition the plastic front panel for his or her modules. II. Main Line Track - Each module must have, as a minimum, two mainline tracks constructed according to these standards that will be powered and controlled by the club power supplies at all shows. The requirements for locating the main line tracks are illustrated in figures 5 and figure 6. All other tracks are known as Optional Auxiliary Tracks (OAT). The standards for main line track also apply to the OAT except as specified in section III. A. Rail Code - Code 100 nickel silver flex track will be used for all mainline tracks. C. Minimum radius - 36"
1. Mainline tracks end 2" from the end of the module. Figure 6 illustrates one method of accurately establishing the 2” cutback. 1. Code 100 nickel silver rail. 2. PECO (ELECTROFROG) and Shinohara, are suggested brands. Other brands of similar quality and operating characteristics are also acceptable with prior approval by the Standards Committee. 3. The minimum frog number is #6 (or PECO medium radius). #8 (or PECO large radius) should be used where possible, and are required for main track crossovers. 4. Dead frog turnouts shall not be used. 5. All turnouts must be gapped on both legs of the frog, with one exception. If the turnout is a spur that can NEVER be connected to another track then the spur side of the frog need not be gapped so the turnout can be power routing. In that case, power drops must not be added to that rail. 1. All track joints within the module must be soldered. 2. All insulating joints (gaps) must be filled. 1. Wood, Homosote, and cork are acceptable materials. 2. Other materials must provide adequate support to prevent the track from shifting under a train. Non-rigid foam roadbed is specifically prohibited. 3. Roadbed must extend to the ends of the module. 1. Transition from straight track to curved track must be tangent with no visible kinks. 2. All track work shall be made up of smooth transitions and short “S” curve type track work is not allowed. III. 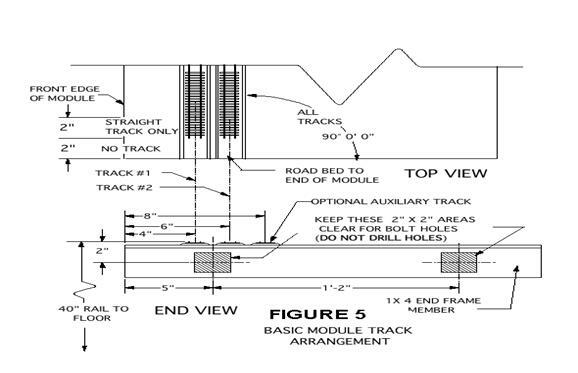 Track work for OAT (Optional Auxiliary Tracks) – Optional Auxiliary Tracks are optional and are at the discretion of the module owner. Club members are encouraged to have OAT trackage as it adds operational opportunities to the club layout. All track work for OATs shall conform to the standards for main line track with the following exceptions. B. The minimum radius is 18 inches (however it is suggested to try and maintain a minimum of 24 inches). C. Smaller turn-outs are also allowed but they must not have dead frogs. D. Grades are allowed on the OAT tracks. 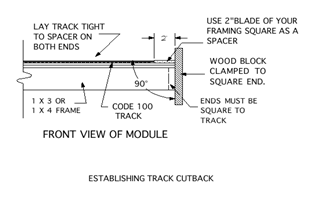 If the track runs trough the module and can be connected to other modules at either end then the grade can not exceed 2% (1/4" per foot) and the change from level track to grade must be a vertical curve as illustrated in Figure 7. E. Tracks that do not connect to other modules can exceed the 2% requirement. F. For members who are adding OATs that are of different gauge (HOn3) and the track is intended to connect to other modules then all the above rules apply. If the track is independent of the main lines the track work must at least be prototypical and it is suggested that the above rules be followed. IV. Track Power Wiring - All track power is passed from one end of each module to the other by means of a continuous track power bus with feeder wires soldered to each section of rail. Connections between modules are accomplished by means of commonly available Cinch-Jones (TRW) 2-pin connectors. Color coded wire shall be used to simplify trouble shooting. For more complex track/wiring arrangements a wiring diagram shall be affixed to the module. The following specifications must be followed. 1. The bus wiring shall be 14 gauge or larger and shall be color coded to match the track it services. The bus wire connected to the inside rail shall be color coded to match the track, RED for the outside main, YELLOW for the inside main, and BLUE for the OAT’s. The bus wire connected to the outside rail on all tracks shall be white or black. These are three separate pairs of wires, there is no common rail. 2. All three buses must be present on every module. 3. The bus wires must be run under the respective tracks and must not hang below the edge of the module. 1. Track feeders shall be 20 gauge or larger solid wire, color coded to match the bus wiring. They must extend no more than 5-6 inches below the table top. 2 Each rail must have a track feeder at each end of each module. 3. Each section of rail must have a track feeder irrespective of the length of the track section. 4. Track feeder connections to the bus wires must be soldered (or made using approved suitcase connectors). C. Terminal blocks - Terminal blocks must be affixed to the end board at each end of the module for making connections between the power bus wiring, and pigtails. Additional terminal blocks should be used as needed to keep more complex track/wiring arrangements neat and traceable. D. Interface connectors - Cinch-Jones 2-pin connectors (TRW # P-302-CCT & S-302-CCT). 2. The large pin must be connected to the outside rail of the track and the small pin to the inside rail. The wires must be soldered to the connector pins. 3. Connectors will be color coded with paint or plastic tape. The purpose of color coding is to make it possible to accurately and rapidly electrically connect modules together and to easily verify the connections underneath the modules in poor light. Therefore the color coding must be conspicuous and must be maintained in good condition by the module owner. 4. Where a member's module is composed of two or more smaller modules which are always connected together, alternate connectors of the owners choice may be used for the internal connections provided that the reliability and current carrying capacity are equivalent to the Cinch-Jones connectors specified here. The wires must be soldered to the connector pins unless otherwise recommended by the connector manufacturer. E. Power Supplies/Throttles - All tracks will be powered by and all trains will be controlled by a club specified Digital Command Control (DCC) system. Member owned equipment such as throttles or DCC boosters connected to the club layout must be compatible with the club specified system and configured as specified by the club. All configuration issues will be resolved by the chairman of the Standards Committee or his delegate at each show. V. 120 Volt Wiring - Each module must provide a 120 volt, 60Hz. AC circuit to pass power from one end of the module to the other. A duplex receptacle to provide power for hand tools, soldering irons, DCC boosters, auxiliary power supplies, etc. must be located near the center of the module. All components must be UL (Underwriters Laboratory) approved and all wiring must conform to the National Electric Code. IMPROPERLY OR INCORRECTLY DONE 120 V. WIRING IS DANGEROUS AND CAN KILL YOU. IF YOU DON'T KNOW HOW TO DO IT CORRECTLY, ASK FOR HELP BEFORE YOU MAKE THE MISTAKE. A. A 16 gauge or larger 3-wire insulated cord must be used. B. The receptacle and all 120 V. wiring must be located inside the back edge of the module. D. Both plugs must hang a minimum of 15" below the end board to provide sufficient cord to connect modules of varying widths. E. The cord must be fastened to the module and not hang below the module frame except at the ends. Metal fasteners may not be used. F. A plug strip with a circuit breaker or surge protector may not be used as the required receptacle. VI. Clearances - There must be adequate clearance between the rails and scenery and structures to permit operation of models of the largest prototype equipment commonly operated by Class I railroads. A. Scenery between the rails such as grade crossings must not protrude above the rail heads. B. Ballast must not be piled above the simulated spike heads or tie plates. C. Flangeways must be wide enough for free passage of all model trucks and must be clear of ballast and other scenery materials. D. Horizontal clearances on tangent track must conform to the NMRA Standards Gauge. On curves, there must be a minimum of 1 1/4" between the track center line and any portion of any structure or scenic element. This is consistent with the requirements of NMRA Standard S-8. E. Vertical clearances must be adequate to permit unimpeded passage of tall equipment such as "double-stack" trains. The minimum vertical clearance on the two main tracks is 3.5 inches with a flat top equal to the full width of the NMRA Standards Gauge. VII. Interface/Setup Requirements - Each member must provide the hardware required to connect the left hand end of his or her module to the adjoining module and is responsible for establishing that joint at each show. A. Bolts - Two 5/16 NC (minimum length = 1 1/2") with fender washers to mechanically join the modules. B. Interface Tracks – The club will provide the interface tracks for all standard modules. A member exhibiting a non-standard module must provide the interface tracks as herein provided or as required by the Standards Committee. C. Setup - Each member is responsible for connecting the left hand end of his or her module to the adjoining module at each show. This includes adjusting the height of the modules, leveling the joint, bolting the modules together, installing the interface tracks, establishing the electrical connections between the modules, and mounting the plastic on the fronts of the modules. Before installing the interface tracks and establishing the electrical connection the member must determine, by consulting the setup plan or the member responsible for the setup, whether or not electrical gaps are required. The club will supply the plastic rail joiners. The plastic should not be mounted on the front of the modules until all interface tracks have been installed on both ends of the module. Recognizing that some members may have, or wish to build, modules conforming to the NMRA module standards, the following provisions for NMRA Standard Modules have been adopted. 1. An exception to these standards is granted to modules that are constructed according to NMRA standards MS-1.0 and MS-1.3. 2. NMRA Standard Modules must conform to all provisions of this standard that do not conflict with MS-1.0 or MS-1.3. 3. Each member exhibiting an NMRA Standard Module must provide the interface tracks required to connect the module to other NMRA Standard modules and to modules built according to this standard. 4. Each member who wishes to exhibit an NMRA Standard Module must provide temporary trackage extensions that are sufficiently rigid and adequately secured to the roadbed to permit the club fixture to be used to drill the bolt holes in the ends of the module. - These standards are not meant to preclude the use of alternate construction techniques that appear promising for construction of lightweight modules. In particular, there have been several articles in the model press regarding the use of steel studs to make a very lightweight rigid module frame. Members wishing to use alternate construction techniques shall have their design approved by the Standards Committee before starting construction. Prior approval of a design by the Standards Committee shall not exempt the completed module from complying with the other requirements of this standard, particularly but not limited to rigidity and the method used to connect modules together. Note that this may require that the end boards be wood. C. Existing Modules - Existing modules that have been approved as meeting the provisions of the 1996 Standard and the “ Upgrading Existing Module Wiring for DCC” document may continue to be used as long as they are maintained in good operating condition. Modules that require significant changes shall comply with this standard unless the Standards Committee determines that a particular change is unnecessary and/or unreasonable.